Lil' Temperance™ 3 G-10 Bl - Spyderco, Inc. Page 1032 – Spyderco, Inc.
Spyderco’s original Lil’ Temperance and Lil’ Temperance 2 took the high-performance qualities of our iconic Temperance™ fixed blade and distilled them into a powerhouse folding knife. Now the Lil’ Temperance 3 revives this classic design in a leaner, simpler form that is ideal for both utilitarian and personal-defense use. The Lil’ Temperance 3’s broad, leaf-shaped blade is full-flat ground from CPM S30V particle metallurgy stainless steel, giving it an incredible balance of strength, edge geometry, corrosion resistance, and low-friction cutting performance. Its minimal ricasso (the unbeveled portion of the blade near its base) maximizes the length of the cutting edge, while a fully accessible Trademark Round Hole™ allows high-speed one-handed opening of the blade with either hand. 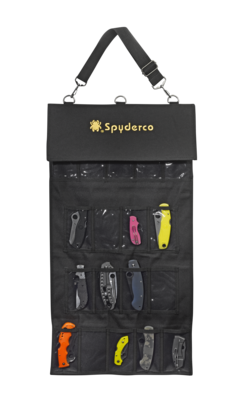 Spyderco’s patented Compression Lock™ mechanism locks the blade securely open during use and also allows safe, easy, one-handed closing. This high-strength lock is built on a foundation of sturdy stainless steel liners nested into CNC-machined recesses in the handle’s textured G-10 scales. In keeping with the design’s original spirit as a potential personal-defense tool, each scale includes a single indexing “divot” that aligns precisely with the concave portion of the knife’s four-position pocket clip to provide a pivot axis for grip-change maneuvers. The clip itself is Spyderco’s time-tested hourglass design and can be easily configured for either left or right-side, tip-up or tip-down carry. The Lil’ Temperance 3 is both a rebirth and a significant evolution of a true Spyderco classic. It faithfully honors the spirit of the original design, while incorporating a number of significant refinements that make it even more functional and capable.